Today's stitch was chosen because, well, it's from a pumpkin I stitched more than a few years ago...and it's Thanksgiving Eve. And a very happy Thanksgiving to all! I'm very grateful for your support and input as I got this little labor of stitching love off the ground this year. 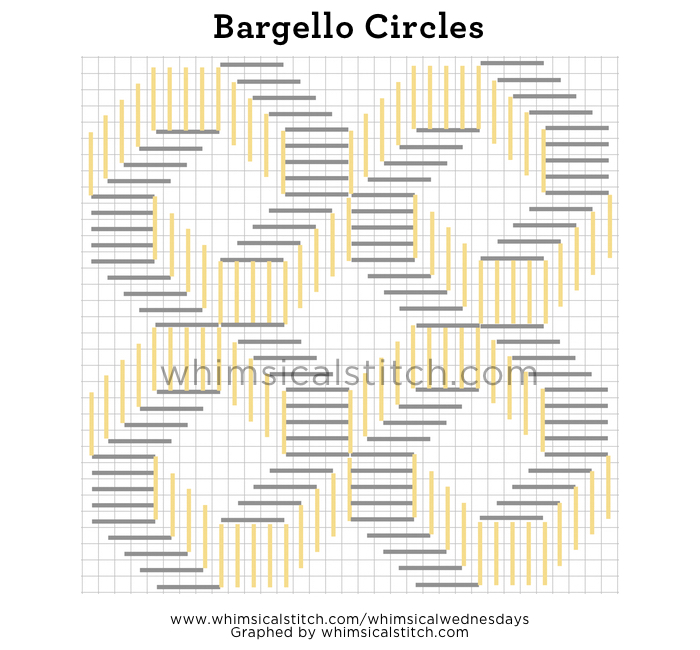 The stitch is called Bargello Circles. It's a great large space stitch for an area you want to draw attention to. It is a complex stitch yet, once you identify patterns, it becomes manageable. Seeing this stitch in context is very helpful and the stitched sample is on Instagram. Let's break down the stitch into sections to help it make sense. Each circle is made up of four separate crescents. What makes the crescents so easy is all of the stitches, whether horizontal (the gray lines in the first diagram) or vertical (yellow lines), are over four rows. Each "section" of the individual crescents making up a circle is five rows wide, with a shared row on either side of the middle section. I find it best to have two needles threaded at the same time. Create one circle at a time, adding each of the four crescents in the order most comfortable for you. The center of each circle is where the fun begins. As I mentioned earlier, this stitch commands attention. You can moderate that attention through whatever you do in the centers. The diagram below offers five different scenarios. I do not recommend any sort of diagonal stitch, such as Plain Needlepoint, for the centers. The crescents and resulting circles are horizontal or vertical straight stitches and I believe the direction they established should be maintained. I tend to use matte threads with similar color values for the crescents and a metallic in the center. Think Silk & Ivory, Pepper Pot Silk, or Vineyard Silk for the crescents and a Rainbow Galleries metallic, such as Frosty Rays, for the centers. If you want to really make this stand out, use two contrasting colors for the crescents, such as red and purple or black and white, with a gold, silver, or white metallic in the center. Be warned...that will be a very dramatic stitch. And, for some pieces, absolutely perfect! Enjoy! And I hope you have a very, very happy Thanksgiving!